Two workdays were held in March, on the 17th (St. Patrick's Day!) and the 24th. We had a good crowd for the 17th, but not many folks for the 24th. There was some speculation about why that was with two theories eventually proposed; the price of gas had risen so dramatically that some opted to stay home, and / or that the usual reminder e-mails had not been circulated for the 2nd workday. Hmmmm.... Well, we can easily fix one of those potential causes! So what got done those two days? There were several people working on the Tommies, but only on the 17th. 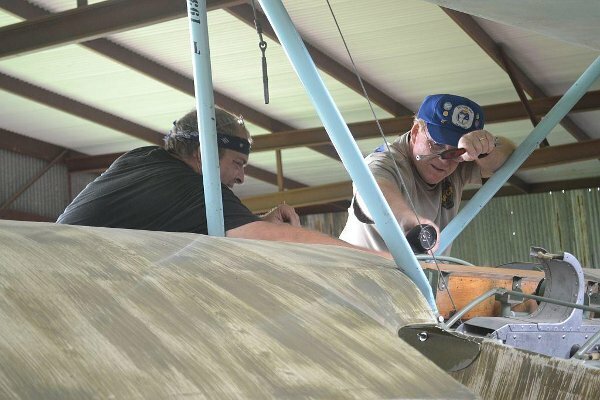 Dave Miller and Jerome Matula continued working on T-1's fabric rub strips - those sinuous strips of wood that attach to the sides of the fuselage longerons to prevent the metal brackets and bolt heads from damaging the fabric covering. Jerome sanded the rub strips - the last step prior to installation, while Dave continued work on the engine's cheek cowl frames. Tom Miller, Sam Miller, Jerry Stark, Steve Richardson and for the early part, Ron Marcotte, worked on putting T-2 in shape for display at Camp Mabry's annual "Muster" event in Austin on April 21st / 22nd. The turtle-deck was cleaned up and secured in place. The team temporarily installed a seat, fuselage upper cowl panels, engine, main engine cowl, prop, T-1's main landing gear (because the legs were in Army green), T-1's wheels and tires plus the tail skid. 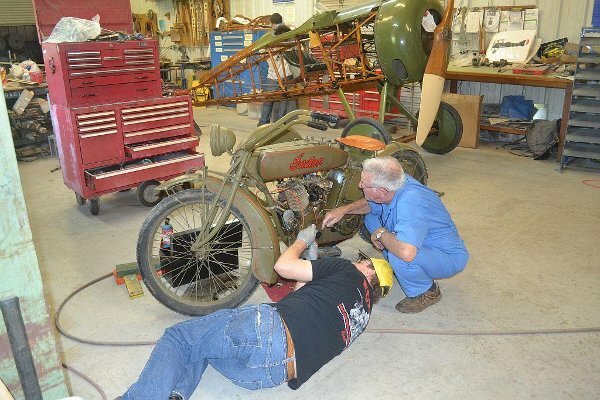 The airplane looks pretty interesting and we hope it will make a nice companion piece to the Model T ambulance and the Indian with side car that will also be displayed at Camp Mabry. Bill Walsh is working on supplemental display posters for the event. Ron Marcotte also fashioned some longeron rub strips that were missing from the tail section of T-2, a task he'd started the prior work day in February. Lastly, it is time to select a motor for T-2. Steve Freeman and Tom Miller rooted around in the storage hangar and picked the 80-hp Le Rhone currently mounted on an original test stand. It was running at one time for there is plenty of castor oil residue gumming up the valves, plus it also has all its parts. The motor doesn't spin, but it is believed that is due to the castor oil residue gumming up the parts - which would be good news because that would indicate everything has been well protected from rust all these years! No work was done on the Thomas-Morse projects on the 24th. 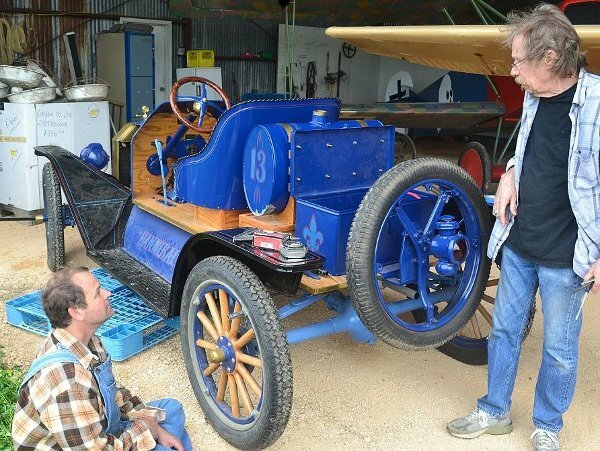 The workday on the 17th saw the Triplane come very close to being 100% back together. A team of workers, led by Michael Craig, his father Donald Craig and a guest named "Snoopy", worked on getting the airplane back together. They reinstalled the rebuilt (and leak tested) fuel / oil tank and installed a new fuel valve so future work involving servicing the strainer bowl is easier. The fuel and oil lines were all plumbed and the rebuilt magneto was installed. Usually these magnetos are held in by three bolts, but one of the mounting holes was covered up by the glued-in capacitor. However most mags are held with only two bolts so the installation was completed (hopefully the unusable bolt hole is the one that is an absolute bear to reach - the "braille" bolt cause you can't see it at all, you can only feel it!). 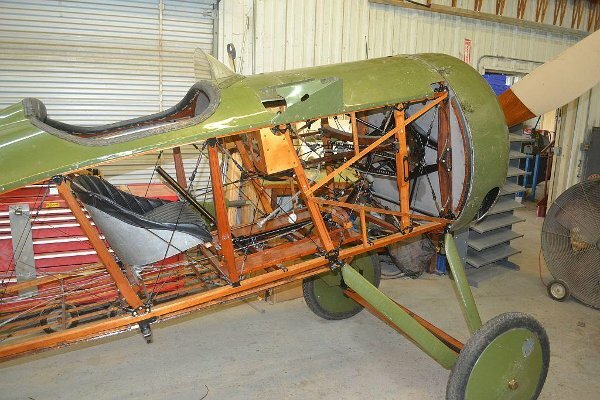 The fuselage's upper cowl panels were refitted and fastened down, plus the machine guns were bolted into place. All that remained to be done at the end of the 17th was reinstall the cabane strut cross bracing cables, attach the engine cowl and bolt on the prop! However, no further work was done on the 24th as Steve wanted the guys doing the job to finish it to ensure nothing dropped between the cracks. Mike may find himself finishing the Triplane the morning of the Air Fair - so flying the airplane at the event will not happen. The most we could hope to do is start it for the crowd. The Piper Cub's annual was pretty much done aside from changing out the engine! In February an engine had been located in the hangar and went with Steve to Memphis for overhaul, and this trip back he brought the engine he'd originally intended for the Curtiss Junior. So quite a cast of people started prepping the new engine for installation - Steve Freeman, Don Dixon, Billy Cheshire, Art Wilson, Dave Orloff and Dave Edgerly for starters! There was an issue with the engine mount rubbers, fortunately Don had an almost complete set at his home hangar and flew them back out to the field. Work was done getting the magnetos mounted and the baffles to direct cooling air over the cylinder fins were reinstalled. It appeared as though one starts with a cooling baffle and builds the remainder of the engine around it! Despite the major manpower commitment to this project it remained unfinished, so I am sure it will be a priority job in April. As part of the prep for the upcoming Air Fair on April 28th the Meyers was pulled from the hangar and inspected for flight. Steve wanted to get it going, then land and pick up a passenger to fly to a local airport for fuel. It was difficult to get the engine started as it appeared that the prop had been turned backwards, pulling engine oil out of a cylinder and into the intake or carb. Spark plugs for the lower cylinders were removed and the engine turned over by hand with copious amounts of oil blatting out the plug holes, and still the engine drooled oil out the stacks for awhile! But eventually the engine fired off and all was well again. Ian got to be the passenger and enjoyed his flight! The Great Lakes was prepped to fly to the airport for refueling but may not have been flown. One of the volunteers drove to the airport and returned with fuel and since it was getting late the Great Lakes may not have been taken up. Kevin Monahan continues working through the issues with the Indian. On the 17th he removed the fuel tanks in an attempt to correct some leaks around the valve inspection covers. After removing the screw-in covers Kevin cleaned anti-seize compound off the threads and applied blue Locktite instead and tightened them down as much as he dared - there are no specs in the manual. With that addressed, the fuel tanks went back on. There are also leaks in some of the metal oil lines, so Kevin sweated on the original ferrule on the oil line from the tank to the pump. If the Indian continues breaking the metal lines from vibration Kevin thinks substituting portions of rubber hose may help solve the problem. On the 24th Kevin made a new oil line that feeds the front cylinder to replace the badly leaking part and installed it. He also slightly modified the clutch hand lever so it would accept a replacement black knob for the end. The tab that inserts into the knob had to be filed down so it would fit and a hole was drilled and tapped for the set screw. Big improvement - and "Thanks" to Al Sumrall for tracking down and procuring the knob! Also on the 24th Kevin installed a new points cam mag in the Indian. It is actually a ring with a lever coming off one side for the advance mechanism. The bronze ring has two "cam lobes" secured by screws on the ring's inner face and Kevin says the cam lobes are much "shorter" than the Harley ring that was in the bike - Kevin is hoping the increased dwell time will permit a hotter spark. The ring fits on the end of the magneto and is held in place by the magneto cover which is secured by a thin strip of spring steel. Al researched the proper spark plugs for the Indian and the new set proved to be very different from what was in the bike. In his spare time, Kevin is also rebuilding the Triumph at his home shop. The complete rear section, engine, transmission, front end minus fender, handlebars (including levers and cables), seat, headlamp and brackets are all installed. However, the front fender is turning into a problem. The fender ended up with a significant hole in it at the powder coaters when they stripped off the old paint. An attempt was made to weld a patch over the hole, but that did not turn out as well as was hoped. Kevin says he thinks he can grind it down and make it black again! Kevin hopes to have the bike running at the Air Fair, but if he isn't happy with his repair job on the fender it'll probably have to go to a professional shop - if that happens it will almost certainly miss the Air Fair! John Bush and Lynn Howell (and the ever present & wickedly feisty "Killer", aka Jerry Lee) with an assist from Ian Whitaker spent much of the 17th working on The Blue Racer - correcting the battery box issue and they tackled some air leaks in the racer's tires. On the 24th Cameron and Ian installed a starter on the Blue Racer so it doesn't have to be towed to get it started anymore. Cameron and The Daves (Edgerly & Orloff) spent time driving the Blue Racer around the property and everyone has been somewhat surprised at the car's power. However, it was also discovered that it has some oil leaks - and since Al reported the leaks by capitalizing "Oil" I assume they are serious leaks! Also on the 17th, Ian identified some issues with several Ts; a broken battery terminal on the TT and the US Ambulance seemed low on gas because the carburetor was acting strange, even though Cameron had recently rebuilt the unit. Lastly, the French Ambulance had an ignition issue due to a faulty buzz coil which will need some attention. Cameron and Bruce spent a fair amount of time working on their Model T vehicles on the 24th. Cameron's is in the improvement stage, as it has been running for awhile and is constantly used for lunch runs to Edna's Country Café! But the 24th was significant as this was the first time in about 4 - 5 years that Bruce's Touring car started and ran! Sweet Victory! Al Sumrall and Ian Whitaker had some new Model T tires set up by Texas T as replacements for the leaking Blue Racer tire and the leaking tire on the Signal Corps truck. (Tires leaking air at Kingsbury? What a shocker!) Turns out the effort was unnecessary since Lynn and John fixed the leaks and got the tires remounted on the vehicles the prior workday. Al found the silver lining when he realized he now has a pair of really nice spares for the Blue Racer and the Signal Corps truck. As usual, Model Ts were fired up for the lunch run to Edna's. No reports of parts falling off or strange misfires or odd vibrations or other paranormal phenomena occurring during the short drive! On the 17th Richard Smith spent his day clearing brush from around the property's entrance which improved the appearance of the entrance significantly! Also Carl Canga has started a project to make a cactus garden at the fork in the entrance road, though he may be considering abandoning the idea? Dave Gaylord set up and tested a wireless link to the PFM PC which will allow credit cards to be accepted at the pavilion during fly-in events. The range was a little too far, so one repeater will need to be set up in a vehicle around the halfway point and the other repeater can be set up adjacent to the usual display / sales spot. Dave Orloff has boosted Kingsbury into the "Green" movement by making the connections that resulted in an oil recycling bin being located at Kingsbury, as well as a drum for oil filters. These were moved into a "final" position on the shop apron on the 24th. The bin is for petrochemicals only - so no coolant or water-bearing waste is permitted in this container! Also the drum is only for oil filters - please no rags or other waste. Periodically the vendor will stop by and empty both the bin and drum and recycle the contaminated oil. Thanks, Dave! Dave Orloff and Dave Edgerly have been cataloging model kits that were part of the Zakrzewski collection that was recently donated to the Pioneer Flight Museum. Some kits were retained to be built for eventual display in the Museum building - a date some ways off in the future. The Daves are selling spare / excess kits at various modeling events around the central Texas region as a fund raiser for the museum. Their first event appearance was at the Lone Star Figure Show in Dallas on Saturday, March 30th. The Daves report they managed to sell enough kits to raise about $150 for the museum after the expenses for the booth space was paid! That was all the news for March, folks!